Overlooking Central Park in the luxurious landmark Plaza Hotel, accomplished gem expert and award-winning designer Bella Campbell received top fashion and accessories journalists and important clients for a private viewing of her first major collection of one-of-a-kind gem-set jewels Oct. 30. 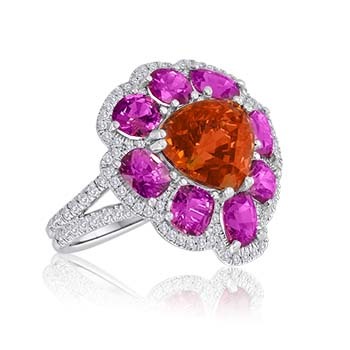 Garnet Spinel Ring: Mandarin garnet pear-shaped center, 12.00 tcw, surrounded by eight red spinels, 7.50 tcw, with 1.30 cara ts micro pave diamonds set in platinum. Handcrafted in 18K gold and platinum, Campbell’s singular designs are set with outstanding gemstones, many of which come from her personal collection, amassed over her nearly three decades as chief gem trader for Kaiser Gems, New York. Manufactured in New York City, her style blends a variety of gem types, colors and shapes in elegantly simple geometric designs that are inspired by everything colorful—from sunsets and wildflowers to china patterns and her son’s artwork. American Gem Trade Association Spectrum Design Award winner, Honorable Mention in the Bridal Categ ory, platinum earrings featuring aquamarines (5.61 tcw) and grossular garnets ( 3.51 tcw), accented with diamonds (.56 tcw). As the perfect prelude to her launch, Campbell was honored with her third American Gem Trade Association Spectrum Design Award 2015. 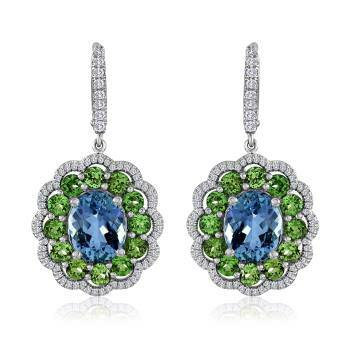 She received an Honorable Mention in the Bridal Category for her stunning platinum earrings featuring aquamarines (5.61tcw) and grossular garnets (3.51 tcw), accented with diamonds (.56 tcw). 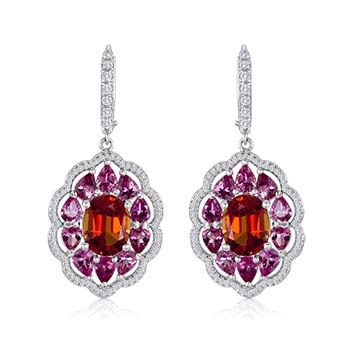 Spinel Earrings: Orange/red spinel centers, totaling 5.00 carats, surrounded by 20 pear-shaped hot pink spinels, totaling 4 .00 carats, and .65 carats diamond accents, set in 18K gold. In 2014 she received Platinum Honors in Bridal for her platinum and ruby earrings (6 tcw), surrounded by 1.5 tcw of diamonds; and in 2013, she took Second Place in Bridal for her royal blue moonstone earrings (13 tcw) and diamonds (2 tcw) in 18K white gold. 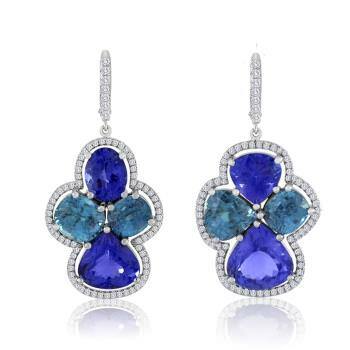 Tanzanite Zircon Earrings: Tanzanite total Weight 14.50 tcw, Blue Zircon 11.20 tcw, diamonds .83 tcw, in 18K White Gold. During her 26-years with Kaiser Gems, in the New York City headquarters of this Los Angeles-based company, Campbell has worked with many of the industry’s leading manufacturers and designer brands, sourcing the best gems from around the world to help them develop winning jewelry collecti ons. Prior to Kaiser, Campbell was an Associate Buyer for The Fine Jewelry Department at Macy’s, New York. She has an MS in Physics from Georgian State University, and an Associate degree in Fashion Merchandise, Retailing and Marketing, and Gemology 1 and 2 from the Fashion Institute (FIT).